Remember the Trigger Event node? We still have to discuss the five advanced policies that were briefly introduced in the Working with an FSM section. 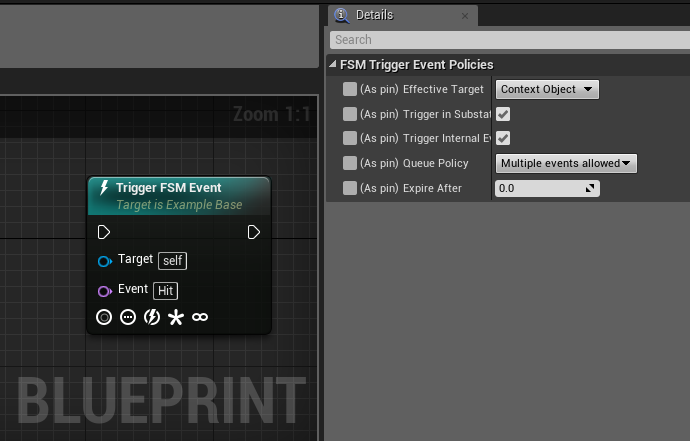 The policies can be used to tweak the effect of the Trigger Event node. Each policy can be specified either in the Details panel of the node or as a pin in the node itself. Moreover, at the bottom of the Trigger Event node itself, graphical icons reminds you about the different policies selected for the node. if it’s a state object (that is, an object whose class is a subclass of “FSM State”) then the “Effective Target” policy decides wheter the effective target is the object itself or its context object. Notice that the Trigger Internal Events and Expire After policies are stored in the queued event since their effect will be applied when the event is processed. Notice that if an FSM has no active state on a specific tick, for example because the execution flow is stuck on a latent function, the tick processing is skipped entirely. This means that the FSM still receives and queues events, but it doesn’t process them. When a new state is entered, a new queue is assembled by appending the queue of deferred events and the queue of unprocessed events. This new queue is then processed normally, by the new state, on the next tick. 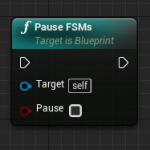 You can check whether a context object has its FSMs paused using the blueprint node Are FSMs Paused. 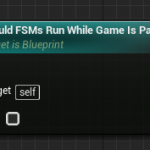 If the game is paused, for example with the Set Game Paused blueprint node, all FSMs of all objects will also be paused. 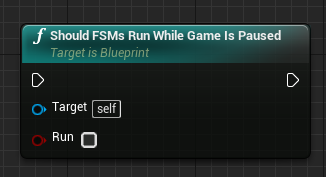 If you desire to have the FSMs of a specific context object to run even if the game is paused, for example in order to drive a menu system, you can use the Should FSMs Run While Game Is Paused blueprint node. 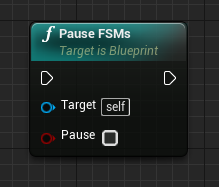 As with the pause nodes described above, this will affect all FSMs of the specified context object. © Copyright 2018, Gamecentric. All Rights Reserved.